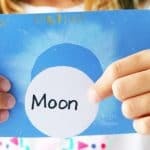 A solar eclipse is one of those rare events you want to make sure your kids remember. 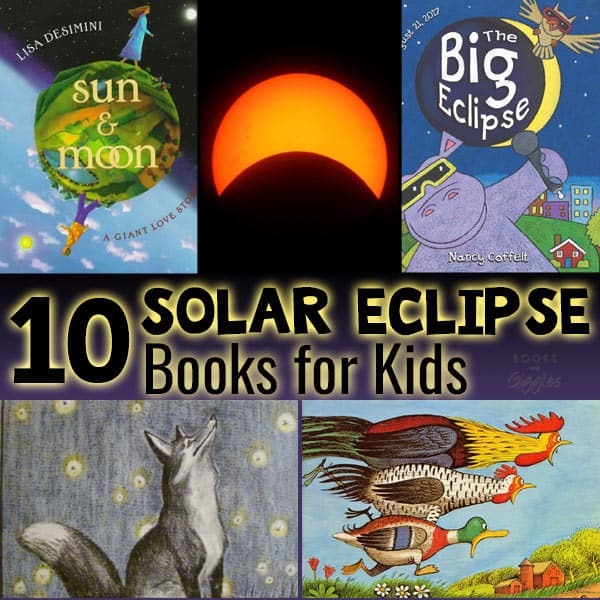 Read one of these solar eclipse books for kids to enhance their experience. An eclipse is kind of like a wedding in its importance, but more fleeting. The total eclipse coming up on August 21 will only last a couple minutes. I want my kids to understand and appreciate every second of it. Several of my choices here are hard to find new, but available in libraries. A few others probably are too new to be in your library. Like I said — eclipses are a rare thing — as are eclipse books, apparently. 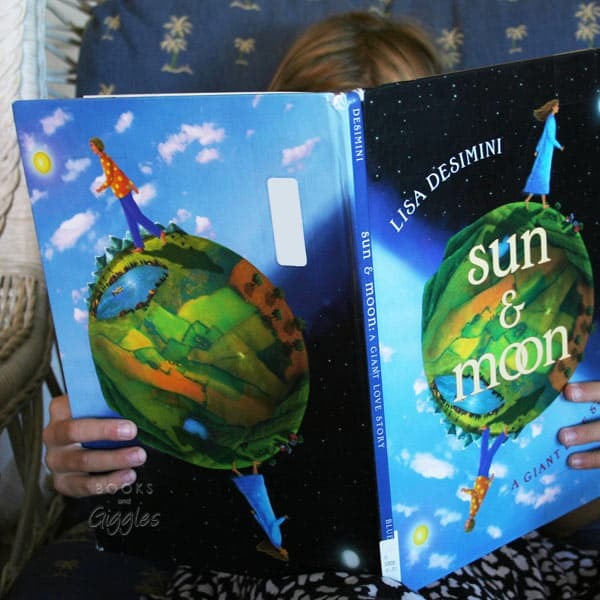 Sun & Moon: A Giant Love Story (affiliate) by Lisa Desimini. A boy-giant and a girl-giant live on opposite sides of the earth. The girl follows the moon around the nighttime side the earth. She’s lonely without any friends her size. The boy follows the sun because he’s afraid of the dark. You see where this is going.… An eclipse comes. The children meet and realize they’re “giants on the same planet.” The vivid, surrealistic illustrations drew my daughter into this book. The Day My Dogs Became Guys (affiliate) by Merrill Markoe and Eric Brace. During an eclipse, a boy’s dogs turn into humans, but still act like dogs. The mayhem that ensues is sure to bring a few giggles. The focus is really on all the crazy things the dogs do, like eating an entire roast turkey and getting stuck under a bed. 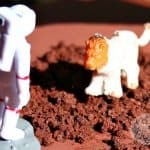 There’s not much detail about the eclipse, other than being the probable reason for the dogs’ behavior. Sunpainters: Eclipse of the Navajo Sun by Baje Whitethorne. The story of a Navajo boy and his grandfather during a solar eclipse. I’m still waiting on a copy of this from my library, and will update my review here when it comes in. It sounds really good! Where Did the Sun Go? Myths and Legends of Solar Eclipses Around the World Told with Poetry and Puppetry (affiliate) by Janet Cameron Hoult looks like a good choice if you’re interested in mythology of eclipses. I found this one too late to get a copy to review, but didn’t want to leave it out. Every Soul a Star (affiliate) by Wendy Mass. Told from several points of view, this chapter book for upper elementary has well developed, interesting characters, and an eclipse at its center. 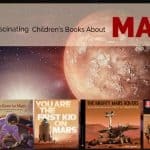 Eclipses (affiliate) by Nick Hunter is a detailed, fully illustrated nonfiction choice for elementary aged kids. It covers both lunar and solar eclipses, effects on wildlife, and even gets into eclipses on other planets! Looking Up! 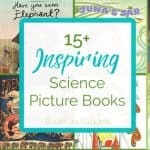 : The Science of Stargazing (affiliate) by Joe Rao is a more general nonfiction early reader about observing the sky. 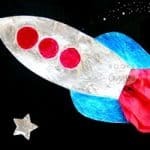 The engaging text covers the sun, comets, constellations, eclipses, and more. It also has an extra section dedicated to the August 2017 solar eclipse. I wish we lived nearer to the path of totality. Even with a partial eclipse here in Texas, though, we’ll be ready for those all important two minutes on August 21st. I hope you will be too!